“The last four signs make the most sense if they stand for the final consummation of all things. This section would then foretell the coming judgments on the earth and the glorious outcome of Christ's reign. Taurus commences with the Greek 'fest of Io' and Roman festival of Pales. Io was the daughter of the king of Argos who (with Zeus) bore Epaphus, founder of the royal families of Egypt and Argos, and ancestor of the Danaids, the fifty daughters of Danaus, king of Argos. Io was worshipped in Egypt and identified with the Egyptian goddess Isis. According to D. James Kennedy's book, The Real Meaning of the Zodiac, the Tribulation period—Christ coming forth like a bull in judgment and a fiery destruction of the wicked—will commence in the spring under the sign of Taurus. “The final four books are the story of the consummation of all things: of the coming of Christ in judgment, of the Great Assize, of the gathering together of His own unto eternal salvation, and the fiery destruction of the wicked. It is the great culmination of the ages which is now before us. As per usual, Aleister Crowley's false prophecy did not come to pass within the time frame predicted. This miscalculation, however, does not negate the fact that the Great Work will assuredly be undertaken at some point in time by secret societies posturing as the Illuminati or enlightened ones. This occult underground believes that the transformation of world—'The Age of Aquarius' or 'New Age of Enlightenment'—was birthed in the sign of Taurus with a grand planetary alignment which occurred following Beltane in the year 2000. One New Age web site, CalenderSign 2000, proclaimed that at the turn of every age (two millennia), there are "revolutionary transformations accompanying the change of Ages...It is the twilight of the gods—the Day of Judgment for the outgoing and incoming Ages." Closing out the present Age of Pisces, May 5, 2000 was to be a day of reckoning, decision and judgment. Later that very month, on May 28, 2000, there was a rare conjunction of the planets Jupiter and Saturn. This conjunction, which occurred in the sign of Gemini, had enormous significance in the New Age scheme because it presaged the reunion of these ancient gods to recreate the new Atlantis—a social order based on the pre-flood civilization which God judged in Genesis 7. The civilizations of Greek and Rome were in fact products of the civilization of Atlantis and Greek and Roman mythologies were based on the Atlantean gods. The Roman Saturnalia, which was a commemoration of the Golden Age of Atlantis, specifically celebrated the overthrow of the god Saturn (Gr. Chronos) by Jupiter (Gr. Zeus), the last god of Atlantis. Saturn is the malevolent god of time, representing the period of chaos and judgment that precedes the reign of Jupiter, the god of benevolence. The Saturnalia also anticipates a return to the Golden Age of Saturn, who will rule over the first half of the Tribulation period, producing the chaos which destroys the present social order. It becomes apparent why Taurus, in the Spring, is so important in the occult endgame. Frances Yates predicted in The Rosicrucian Enlightenment that the transformation of the world return mankind to the mystery religion of ancient Egypt: "Giordano Bruno...propagated throughout Europe in the late 16th century an esoteric movement which demanded a general reformation of the world, in the form of a return to 'Egyptian' religion and good magic." (46:216) Good magic? This would be a reference to what is currently termed “white magic”, à la Harry Potter, who used the “powers of darkness” for good (an oxymoron if there ever was one). In reality, there is no essential difference between “white” and “black” magic. Every form of sorcery is practiced through either indirect or direct recourse to Satan. Orion is also known as the 'lover of Diana', as stated by Ovid who is cited in Star Names: Their Lore and Meaning by Richard Hinckley Allen: "Dianae Comes and Amasius, Companion, and Lover of Diana, were other titles. The Hero, after his death from the Scorpion's sting inflicted for his boastfulness, having been located by Jove (Jupiter) in his present position, at the request of the goddess, that he might escape in the west when his slayer, the Scorpion, rose in the east,- as Aratos said: 'When the Scorpion comes, Orion flies to utmost end of earth'." (927:305) Another version of this mythical affair states that Diana's twin brother, Apollo, tricked her into wounding the head of Orion, whose headless torso was memorialized in the heavens. It seems that, as a giant, Orion could wade through the sea with only his head protruding from the water. "From Persian records we are expressly assured that it was Nimrod who was deified after his death by the name of Orion, and placed among the stars. Here, then, we have large and consenting evidence, all leading to one conclusion, that the death of Nimrod, the child worshipped in the arms of the goddess-mother of Babylon, was a death of violence. Prior to becoming a constellation in the heavens, Orion, one of the Titans in Greek mythology, was the archetype of the hunter. Orion was, as Hislop stated, the hunter Nimrod, who was the grandson of Ham, a son of Noah. The rebellions of Ham and of Nimrod against God are recorded in the book of Genesis. "Thus from Assyria, Egypt, and Greece, we have cumulative and overwhelming evidence, all conspiring to demonstrate that the child worshipped in the arms of the goddess-mother in all these countries in the very character of Ninus or Nin, 'The Son,' was Nimrod, the son of Cush. A feature here, or an incident there, may have been borrowed from some succeeding hero; but it seems impossible to doubt, that of that child Nimrod was the prototype, the grand original. He is said to have been the first that gathered mankind into communities, the first of mortals that reigned, and the first that offered idolatrous sacrifices. This character can agree with none but that of Nimrod. Now the name given to him in connection with his 'gathering men together,' and offering idolatrous sacrifice, is very significant. Although Nimrod [aka Orion/Saturn/Tammuz] was a hunter of men, his religious system was based on a deceptive assurances of salvation without any provision for the fundamental problem of sin. As a type of the Antichrist who will soon be revealed, this false messiah was able to draw the multitudes into his one world religion; as Hislop stated, "men will readily rally around any one who can give the least appearance of plausibility to any doctrine which will teach that they can be assured of happiness and heaven at last, though their hearts and natures are unchanged". Having a form of godliness, but denying the power thereof. (2 Tim. 3:5). "One of his heads as it were wounded to death"
According to Masonic sources, the missing head and legs of Orion are symbolized by the ‘Skull & Crossbones’, which strongly indicates that the Freemason's veneration of John the Baptist (who was beheaded) is really the worship of Orion (Nimrod/Tammuz). 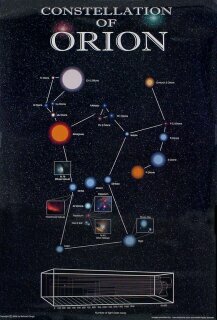 "The omission of Orion's head and legs in the constellation of Orion, illustrated above, is immediately noticeable. It would seem that Orion has had his legs and his head chopped off! "A similar practice was observed by the Knights Templar five and a half thousand years later when they were buried. By adopting this practice the deceased Knights Templar became as one with Orion and, by implication, Osiris. The 'skull and crossbones' … Orion's missing head and legs…were also adopted by the Knights Templar as their emblem, their symbol of recognition. Hubert Anson Newton (1830-96) was an American astronomer and mathematician; he was also doctoral advisor to Eliakim Moore, a Skull & Bones member at Yale. William Dwight Whitney was a senior professor on the staff of Yale University when Star Names was published in 1963. William Dwight Whitney is in all probability a direct descendant of a famous American Sanskrit scholar, William Dwight Whitney (1827–94), who became professor of Sanskrit and comparative philology at Yale following his studies in Germany. A ‘William Dwight Whitney’ also shows up on Antony Sutton's list of personages who have held membership in the Order of Skull & Bones. As the date of initiation is not given, we cannot be certain which William Dwight Whitney is on Sutton's list, but it is not unreasonable to speculate that both Yale professors were members of the Skull & Bones. The 19th century Sanskrit scholar/Yale professor would have lived during the period when the Order of Skull & Bones took over the management of Yale University. "Genesis 7:21-23 stress the theme of universal death: "And all flesh died that moved upon the earth... So He destroyed all living things which were on the face of the ground... They were destroyed from the earth. Only Noah and those who were with him in the ark remained alive.'" According to Laurence Gardner, Noah's son, Ham (who survived the Flood, dishonored his father and was cursed) was Hermes, who taught the Atlantean doctrine to the Egyptians. All young ancient Egyptians were taught that Osiris, the male human aspect of the One Supreme God, lived and reigned as the first king of Egypt. However, Osiris was slain by his evil brother, Seth, who with Osiris, Isis, Nepthys, and the elements, Earth, Air, Fire and Water, formed the One God of the Egyptians, called an Enniad, i.e. nine gods in one. As Nimrod became the constellation Orion after his demise, the Egyptian sun god, Osiris, whose untimely death was mourned by Isis and all of Egypt, is also universally identified as the 'soul of Orion'. "In astrology...[the name] Tripater applied to him. The esoteric interpretation of the myth of Isis and Osiris is disclosed in Spiritual Politics: Changing the World From the Inside Out: "Like the goddess Isis, who found and restored all of the lost pieces of her husband, Osiris, many are restoring the unity of all life, bringing together the separate parts of humanity — different races, religions and cultures." (42:62) From this understanding, we may infer that Osiris was Nimrod—the great hunter of men and unifier of mankind under a pagan religious system—who, as stated by Hislop, 'was the prototype, the grand original'. Nimrod was simply venerated in various cultures under different names: Osiris, Tammuz, Wotan, Viracocha, Quetzalcoatl, Varuna, etc. All were priest-kings who taught mankind the ancient mysteries as well as academic disciplines. By reason of the supernatural powers and intellectual prowess of these divine beings, the civilization of mankind was greatly advanced. All are expected to return to earth to revive the ancient pre-flood mysteries and culture. Osiris, who ruled over the 'First Time,' was able to walk over (or in) the oceans and 'traveled around the globe bringing civilization to many nations'. Thus, we may conclude that Viracocha = Osiris = Adam = Orion. Viracocha is also analogous to Quetzalcoatl of the Aztecs; to the Queshua, Aymara, and other tribes of South America, he is known as Ameru, which means 'serpent'. It will come as a shock to many Americans that the name 'America' is probably derived from 'Ameru', the serpent-god, and not the Italian voyager 'Amerigo' Vespucci! As a celibate demi-god, Quetzalcoatl invented the Mayan and Aztec calendar and bequeathed the secret doctrine to his priests, who were also celibate. Quetzalcoatl was driven away on a serpent boat by his evil twin, Tezcatlipoca (the black twin), but is expected to return from the East (where he spread his knowledge of science and the arts) to reclaim his power among the Mesoamerican people. Does Quetzalcoatl not compare to Osiris, who was also murdered by his evil twin, taught the Hermetic doctrines to the Egyptians, and is regarded as Egypt's 'once and future king'? A promo for a book titled The Return of the Serpents of Wisdom, by Mark Amaru Pinkham, reveals that the various supreme deities were all indigenous serpent-gods! In The Two Babylons, Hislop elucidates the reason for the lamentation for Osiris/Tammuz/Nimrod et al. The untimely death of this false messiah, known in other cultures as Tammuz, Nimrod, Wotan, Viracocha, Quetzalcoatl and Varuna, meant the dissolution of the global religious system established by this demi-god. Because God put an end to Nimrod's 'unity in diversity' experiment, He is forever labeled as the Scorpion in the Zodiac. In Fingerprints of the Gods, Graham Hancock draws attention to the fact that the Giza Plateau and Nile River were representations of the constellation of Orion and the Milky Way respectively. It seems that, after the flood and their expulsion from the earth, the Nephilim left the Sphinx, pyramids and Nile River as markers indicating their whereabouts in the heavens. As the three pyramids of Giza correspond to the belt stars of Orion, there are also three pyramids in Mexico which correspond to the Giza pyramids. This design would give credence to speculation that Osiris and Quetzalcoatl were same god, whose soul is claimed to now reside in Orion. "...archaeo-astronomers making use of the latest star-mapping computer programmes had recently demonstrated that the three world-famous pyramids on Egypt's Giza plateau formed an exact terrestrial diagram of the three belt stars in the constellation of Orion. Nor was this the limit of the celestial map the Ancient Egyptian priests had created in the sands on the west bank of the Nile. Included in their overall vision...there was a natural feature—the river Nile—which was exactly where it should be had it been designed to represent the Milky Way. "The incorporation of a 'celestial plan' into key sites in Egypt and Mexico...,...the monuments of Teotihuacan, like those of the Giza plateau, played important religious roles in the lives of the communities they served. "The Central American traditions...gave eloquent expression to a widespread belief that Teotihuacan had fulfilled at least one specific and important religious function in ancient times. According to these legends the City of the Gods was so known because 'the Lords therein buried, after their deaths, did not perish but turned into gods...' In other words, it was 'the place where men became gods'. It was additionally known as 'the place of those who had the road of the gods', and 'the place where gods were made'. 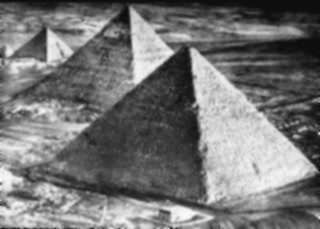 In November of 1983, Masonic author Robert Bauval claimed to have discovered that the ground plan of the main three pyramids at Giza were a replica of Orion's Belt in the Constellation of Orion. In a 1994 book, The Orion Mystery, Robert Bauval and Adrian Gilbert claimed that the shafts of the Great Pyramid were pointed directly at key stars in Orion in a way that reflected the configuration of Orion in ancient times. Using astronomical data about stellar movement, Bauval and Gilbert contended that the Orion stars correspond precisely to the pyramids' positions in approximately 10,400 B.C. This period was called by the Egyptians the 'First Time', when the god Osiris ruled the Earth. As previously stated, Orion represented to the ancient Egyptians the 'soul of Osiris', his body having been mummified and interred in the Giza Plateau in a mysterious location called 'the House of Sokar'. The departed soul of Osiris ruled in specific place in the heavens called 'The Duat' which is the constellation of Orion. As king of the Realm of the Dead, Osiris was the means by which men attained ‘eternal life’! "We find Horus firmly in possession of the earthy 'Kingdom of Osiris' (which had of course been founded in the 'First Time') and we find the body of Osiris himself safely installed in 'the House of Sokar'. Under these ideal conditions, according to the texts, the spiritualized form of Osiris was freed to depart to the sky—and to a specific location in the sky that we have already identified: 'the place where Orion is'. There it was held that he had established the Duat—the cosmic 'Otherworld' on the right bank of the Milky Way—as a sort of 'Kingdom of Osiris' for the Dead. The Great Pyramid was built as a monument to Orion, who, as Osiris was centerpiece of Egyptian worship. Freemasonry, which is also centered on the worship of Osiris and Orion, aspires to revive the pre-flood civilization of Atlantis. The ancient wisdom texts of Hermes Trismegistus, specifically The Book of What is in the Duat, instructed the Egyptian priests that whatever exists in the heavens must be replicated on earth if mankind would restore the ancient pre-flood civilization of Atlantis. On The Message of the Sphinx, Masonic writers Hancock and Bauval have presented detailed information on the Egyptian monuments—a modern 'Book of What is in the Duat' for Neo-Atlanteans. The myth of Osiris, of course, is Satan's attempt to counterfeit the death, resurrection and future reign of Jesus Christ, with the promise eternal life for his disciples, who were called the 'Followers of Horus'. Eternal life for the pharaoh meant that he was reborn as a star in Orion. To aid their ascent to the Duat, 'the place where Orion is', a hymn was sung at the funeral of deceased pharaohs, who aspired to attain to godhood in the celestial 'Kingdom of Osiris'. By "gate of the earth-god", "aperture of the sky window" and "doors of iron", the hymn would seem to be referring to a specific place in the Duat as the portal through which Osiris and the pharaohs passed. This portal was called a 'star gate'. As well, state Hancock and Bauval, it was a 'time gate' where the departed souls attained immortality. The specific portal through which the pharaohs passed is located in Orion's belt of three stars. Specifically, the King's Chamber of the Great Pyramid was aimed at the belt star, Al Nitak, the brightest belt star. Al Nitack was the Stargate when visible. "The Great Pyramid has numerous features which leave us without any doubt that its designers paid careful attention to the stars and tracked their transit at the meridian... Most conclusive of all...is the fine accuracy of the four shafts. Recent investigations have established beyond a shadow of a doubt that in circa 2500 BC — the era recognized by Egyptologists as the 'Pyramid Age'— each one of these shafts targeted a special star as it culminated at the meridian. "From the Queen's Chamber, the northern shaft is angled at 39 degrees and was aimed at the star Kochab (Beta Ursa Minor) in the constellation of the Little Bear — a star associated by the ancients with 'cosmic regeneration' and the immortality of the soul. The southern shaft, on the other hand, which is angled at 39 degrees 30', was aimed at the bright star Sirius (Alpha Canis Major) in the constellation of the Great Dog. This star the ancients associated with the goddess Isis, cosmic mother of the kings of Egypt. "From the King's Chamber, the northern shaft is angled at 32 degrees 28' and was aimed at the ancient Pole star, Thuban (Alpha Draconis) in the constellation of the Dragon — associated by the Pharaohs with notions of 'cosmic pregnancy and gestation'. There is considerable controversy over whether the pyramids today reflect the configuration of Orion's belt. There is also controversy over the dating of the pyramids, whether they were built by the pharaohs in the dynastic era circa 3,400 B.C. or much earlier in 10,500 B.C. The early daters solve the configuration discrepancy by claiming that the pyramids were precisely aligned with Orion's belt in 10,500 B.C., but not in 3,400 B.C. Moreover, the Sphinx conjuncted with the constellation Leo in 10,500 B.C., but not in 3,400. This point of view conveniently supports the New Age belief that the pyramids were not built by men, non-existent in 10,500 B.C., but by the Anunnaki (Nephilim), the gods who visited Egypt in the 'First Time'. "In 2500 BC... the southern shaft of the King's Chamber aligns perfectly with Al Nitak (Zeta Orionis) at an altitude of 45 degrees. But at this point in time the other two stars of Orion's Belt and the Milky Way do not align directly with the other two pyramids and the Nile. "If we 'shift' the sky around..., continually going back in time, we find a perfect match between the pyramids and the three stars of Orion's Belt and the Nile and the Milky way at 10,500 BC ! "As 2500 BC marks the zenith of Al Nitak (i.e.. when it is at its highest point above the horizon), 10,500 BC marks Al Nitak's nadir (i.e., when it is at its lowest point above the horizon). Is this simply coincidence? "The Sphynx (about half a mile away from the pyramids) points due east and in the pre-dawn of 10,500 BC it would have pointed directly at its celestial counterpart - the constellation of Leo. "Therefore, at the moment of sunrise on the vernal equinox in 10,500 BC there would be a conjunction involving the three Pyramids and the Orion's Belt and a conjunction involving the Sphynx and the constellation of Leo. This conjunction marks the beginning of the 'Age of Leo' and the beginning of the upwards precessional cycle of Orion's Belt. "Can all this be accidental? "It seems unlikely that such engineering and astronomical precision can be purely coincidental. Either the Pharaohs had much more knowledge than we even thought remotely possible or, perhaps, a civilisation more ancient than the Egyptians (circa 10,500 BC, maybe?) once existed and was endowed with great knowledge. Adrian Gilbert maintains that, at the summer solstice in the year 2000, the sun was directly over the outstretched hand of Orion, a phenomenon which last occurred in 10,880 B.C. at which time Atlantis was destroyed. Moreover, when Gilbert held an Ankh cross over the Great Pyramid on June 21, 2000, the sun formed a perfect 'Eye of Horus' over the pyramid. "...the Pyramid Khafre on 21st June and in time to see it crowned by the sun. "Today all this has changed. Because of precession the sun is no longer in Leo at the solstice but on the cusp of Gemini and Taurus. In fact it now stands on a position in the zodiac exactly over the outstretched 'hand' of Orion. Curiously enough this position (which I call the 'shake-hands position') is where according to the ancients there exists one of the gates of heaven. There were in fact two of these imaginary gateways at the points where the ecliptic, or pathway of the sun, crosses over the Milky Way. One of these gates was in Gemini over the hand of Orion and the other in Sagittarius over the sting of Scorpio. "This gateway seems to be what is symbolised by the Sahu (Orion) figure as inscribed on the Benben stone of Amenemhet III at the Cairo Museum. He is depicted as a small walking figure holding a sceptre in one hand and cupping a star in the other. This star or 'S'ba' to give it its Egyptian name has a dual meaning as a hieroglyphic. On the one hand it means 'star' but on the other it means 'gateway'. Thus Orion is correctly shown holding in his hand what we might call a 'stargate'. We have mentioned in a previous section, Capricorn, that in the Age of Aries the Gates of the Sun were Capricorn and Cancer but, due to the precession of the equinoxes, those gates, whereby souls descend and ascend to heaven (they say), are now, in the Age of Pisces, Gemini and Sagittarius. In other words, the constellations of Gemini and Sagittarius are on the point where the ecliptic (path of the sun) intersects with the Milky Way (the Galactic Stellar Womb). In Hermetic doctrine, the Orion factor determines when the stargate opens. According to Adrian Gilbert and Graham Hancock, the Stargate opened in the year 2,000 with the sun at the stargates at the solstices, the northern stargate being Orion. This event has not happened since the 'First Time' some 12,880 years ago. In the 1994 movie, Stargate, a magical portal is opened to "the other side of the known universe" through the alignment of symbols on an ancient Egyptian device. The central character, an Egyptologist played by actor, James Spader, is hired to unlock the mysterious hieroglyphs on an Egyptian artifact consisting of a number of symbols enclosed within a circular frame. Spader discovers that the images on the outer frame are not hieroglyphs (Egyptian writing characters) but star constellations. The final symbols to be deciphered turn out to be the constellation of Orion and a pyramid with the sun directly overhead and two priests praying before it. The sun over the pyramid means that the Stargate opens when the sun is over Orion at high noon. This Stargate apparatus to transport human beings through time to another world is described in the following synopsis of the movie. "Jackson researches ancient languages to try and find the meaning of the outer track, but his extensive search is in vain. However, looking at the astrology section of a newspaper he realises that one of the symbols on the outer track matches the constellation Orion. The symbols on the outer track, he realises, are not a written language but star constellations. Jackson presents his discovery to General West and the team of Air Force officers, explaining the seven symbols on the cartouche denote a course. Six symbols show a destination; to specify a particular point within a three-dimensional object, one requires six different points on the surface of that object. Two points on both sides of the object's length draw a straight line, which intersects with similar lines along the width and depth provide one particular point. The seventh symbol, Jackson says, is a point of origin. "The group go into the control center of the Stargate, where Catherine explains the object which her father found is made of a material not found anywhere else on Earth. The Stargate contains all the symbols which were present on the outer circle of the artefact, and Jackson identifies the point of origin; previously undetected as it does not contain as much detail as the symbol on the cartouche. "...Orion, the great hunter of Greek myth, was the owner of a dog. When Orion tried to ravish the virgin goddess Artemis she produced a scorpion from the earth which killed him and the dog. Orion was transported to the skies where he became the constellation that bears his name today; his dog was transformed into Sirius, the Dog Star. "Precisely the same identification of Sirius was made by the ancient Egyptians, who linked the Orion constellation specifically to their god Osiris. It is in Ancient Egypt too that the character of the faithful celestial dog achieves its fullest and most explicit mythical elaboration in the form of Upuaut, a jackal-headed deity whose name means 'Opener of the Ways'. If we follow this way opener to Egypt, turn our eyes to the constellation of Orion, and enter the potent myth of Osiris, we find ourselves enveloped in a net of familiar symbols. "The reader will recall that the myth presents Osiris as the victim of a plot. The conspirators initially dispose of him by sealing him in a box and casting him adrift on the waters of the Nile. In this respect does he not resemble Utnapishtim, and Noah and Coxcoxtli and all the other deluge heroes in their arks (or boxes, or chests) riding out the waters of the flood? Orion is Osiris, god of death and resurrection/transformation. Took form of wolf when he returned from underworld. Tribe of Benjamin.